Today’s professional vacation rental managers are integrating technology into their operations more and more, and reaping all sorts of benefits, from increases in bookings and inventory to greater operational efficiencies and reduced overhead. One of the newest subsets of technology in the vacation rental industry is smart home technology. And in today’s post (courtesy our friends at PointCentral), we’ll be exploring how making your homes smarter can increase your profitability. According to HistoryOfKeys.com, the first keys were invented some 6,000 years ago in ancient Babylon and Egypt. So, they’re hardly a technological advancement. But, in all those years, we really haven’t seen a smart alternative, until recently. The problem with keys for vacation rental managers is they’re hard to keep track of and expensive and time consuming to change out. And, when you have hundreds of different guests sharing the same keys over a period of years, they’re hardly secure either. But smart locks eliminate a lot of the hassle and security issues associated with keys. You install them once, and they can be changed instantly and dynamically, thanks to new technology and the prevalence of wireless internet service. This is the bread and butter of what PointCentral offers VRMs. A big advantage with the PointCentral solution is that all of this happens via the cellular network. A smart communications hub installed in every property connects every PointCentral device in the property to the cellular network, thus eliminating the need for a Wi-Fi connection. This architecture, proven in more than 5 million homes in the U.S., is much more reliable than Wi-Fi, which often requires a manual restart. With LiveRez’s deep integration with PointCentral, not only can you automatically change the lock codes with every new reservation, but you can unlock doors remotely. All a manager has to do is click a button within our RealTimeManager (RTM) dashboard to unlock the door for a guest. No need to get in the car (at whatever hour) and drive a key out to a guest. Another great thing about using codes instead of keys to enter a house is the tracking that comes with it. 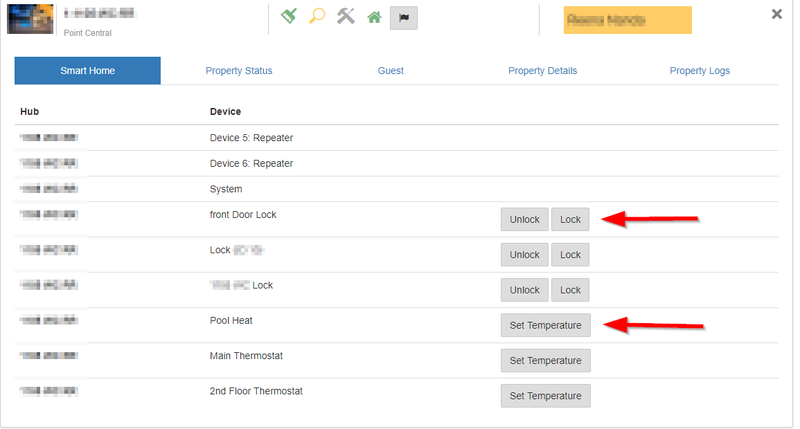 From LiveRez’s RTM dashboard, users can see the real-time occupancy status of every property based on the arrival and departure lock codes entered by the guest. These lock codes are generated automatically with every new reservation in LiveRez, and are available as a mail merge macro in our CRM system, making it easy to include them in personalized emails to guests (which can also be automated from within LiveRez). Cleaners, maintenance workers, and inspectors can also be given their own codes to enter the house. And when they input their entrance and exit codes, events are sent to LiveRez, which can then automatically update the home status on the RTM dashboard. This allows managers to have real-time visibility over the status of their operations. These events not only trigger status changes in real time, but also create an audit trail of who entered and exited the house (and when). Another way that smart home technology can save managers (and their home owners) money is by monitoring and optimizing the energy settings in the house. You can program PointCentral’s smart thermostats to increase or drop the temperature around check-ins and check-outs, and even monitor and control room temperature remotely, allowing you to spot potential issues quickly and address them proactively. The energy savings are the real deal. In an initial test, one LiveRez partner reported a 38% decrease in its homes’ gas bills and a 14% decrease in its homes’ electricity bills. Just days ago, PointCentral announced an integration with Amazon Echo and Google Home Voice Assistants. Basically, this allow guests to control smart devices (like locks, thermostats, lighting, etc.) with their voice. Imagine being able to advertise that to prospective guests? From eliminating keys and remotely controlling locks, to real-time property intelligence and automated alerts, VRMs are enjoying significant operational savings from implementing Smart Home technology.